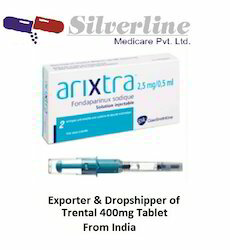 We are a leading Exporter of arixtra 2.5 mg injection, istamet 50/500mg tablet, istamet 50 /1000mg tablet, calaptin 120mg tablet sr, cardivas 12.5mg tablet and cipril h tablet from Nagpur, India. We are remarkable entity, engaged in offering superior quality range of Arixtra 2.5 mg Injection. This injection is processed utilizing premium quality ingredients as per the set standards of market. The given injection is comes in tamper proof packing in order to maintain its effectiveness. Offered injection is used in treatment of blood clots and prevention of blood clots. 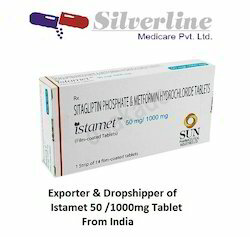 Our company has relentlessly pursued excellence in its endeavor by providing premium quality Istamet 50/500mg Tablet. This Istamet tablet is processed by vendor’s experts using best quality ingredients & leading methodology in accordance with the market standards. 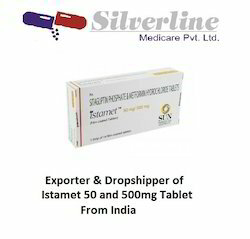 Offered Istamet tablet is provided in numerous grades in tamper proof packing. As well, this Istamet tablet is tested on numerous stages by quality controllers so as to deliver a pure range from our side. To meet diverse requirements of our prestigious clients, we are engaged in providing Istamet 50/1000mg Tablet. This Istamet tablet is formulated from the best quality ingredients & advance methodology keeping in mind the set medical norms. The offered Istamet tablet is provided in best quality packaging options to assure that these remain safe during its transportation. Customers can avail this Istamet tablet from us at affordable price in a given time frame. Calaptin 120 mg tablet sr is used in the treatment of increased blood pressure, angina and arrhythmias. 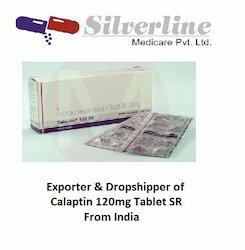 Calaptin 120 mg tablet sr is a calcium channel blocker. It blocks the action of calcium on the heart and blood vessels. This effect reduces blood pressure and abnormally fast heartbeat which lowers strain and oxygen requirement of the heart. We are the Leading suppliers of Cardivas 12.5mg Tablet. We also do Drop Shipping of Cardivas 12.5mg Tablet. 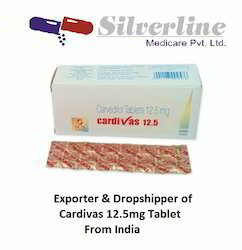 Cardivas 12.5 mg tablet is used in the treatment of increased blood pressure , heart failure and angina. Cardivas 12.5 mg tablet blocks the action of certain chemical messengers on the heart and blood vessels. This effect reduces heartbeat, blood pressure, and strain on the heart following a heart attack. 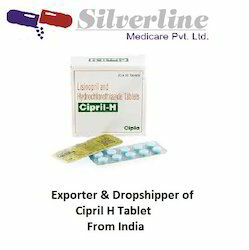 Cipril (Lisinopril) is prescribed to reduce and manage hypertension (High Blood Pressure). As a result of lowering blood pressure, the associated risks of heart attack, kidney problems, and stokes are also reduced. It is usually only prescribed to patients who have already tried other hypertension drugs unsuccessfully. Dosage: Always take Cipril (Lisinopril) as you have been prescribed. Correct dosage can vary depending on the patient and the severity of their hypertension. Tablets should be swallowed whole and washed down with a full glass of water. As this medication acts as a diuretic it is recommended that dosing is done in the morning so as not to disturb sleep. The benefits can usually be seen after 2 to 4 weeks of use. Contraindications: Hypersensitivity to sulphonamide drugs, patients with anuria, aortic stenosis or hyperkalaemia, history of angioneurotic oedema related to use of Angiotensin-converting-enzyme (ACE) inhibitors, hereditary or idiopathic angioedema, lactation. 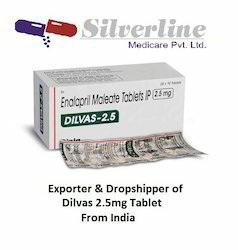 We are the Leading suppliers of Dilvas 2.5mg Tablet. 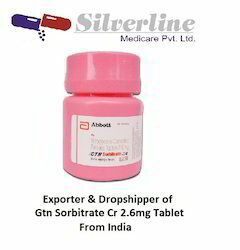 We also do Drop Shipping of Dilvas 2.5mg Tablet. Dilvas 2.5 mg tablet is used in the treatment of increased blood pressure , heart failure, heart attack and diabetic kidney disease. Dilvas 2.5 mg tablet relaxes the blood vessels which lowers the blood pressure and also reduces the workload of the heart. As a result, the heart works more efficiently. We are the Leading suppliers of Endobloc 10mg Tablet. 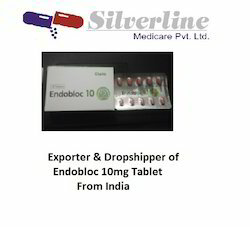 We also do Drop Shipping of Endobloc 10mg Tablet. Endobloc 10 mg tablet relaxes the blood vessels of the lungs, which in turn lowers the blood pressure. Severe Allergic Reactions (Rash; Hives; Itching; Difficulty Breathing; Tightness In The Chest; Swelling Of The Mouth, Face, Lips, Or Tongue; Unusual Hoarseness); New Or Worsening Shortness Of Breath; New Or Worsening Swelling Of The Hands, Legs, Ankles, And Feet; Sudden Or Unusual Weight Gain; Unusual Tiredness Or Weakness. Ambrisentan Is An Endothelin Receptor Antagonist. It Works By Blocking A Certain Substance In The Lungs, Which Helps To Decrease Blood Pressure In The Lungs. Ambrisentan May Cause Serious Birth Defects If You Take It While You Are Pregnant. Women Who Are Pregnant Should Not Take Ambrisentan. You Must Have A Negative Pregnancy Test Before You Start To Take Ambrisentan, Monthly While You Take It, And For 1 Month After You Stop Taking It. GLYCERYL TRINITRATE :Adult: PO Stable angina Extended release Up to 12.8 mg 3 times/day. IV Unstable angina Initial: 5-10 mcg/min. Usual: 10-200 mcg/min. Heart failure Initial: 5-25 mcg/min. Acute MI; Induction of hypotension or control of HTN during surgery Initial: 5-25 mcg/min. Usual: 10-200 mcg/min. Max: 400 mcg/min. Rectal fissure As 0.4% oint: Apply 1.5 mg 12 hrly up to 8 wk. Topical Stable angina As 2% oint: Apply 0.5-2 inches 3-4 times/day. Sublingual Acute angina 300-600 mcg, repeat if needed. Seek medical help if pain persists after a total of 3 doses w/in 15 mins. As aerosol spray: 1-2 sprays of 400 mcg each. No more than 3 metered doses to be taken at any one time and min of 15 min interval between consecutive treatments. Buccal Acute angina 2-5 mg 3 times/day, increased if needed. Heart failure 5 mg, repeat until symptoms are controlled. Transdermal Stable angina Per patch releases 2.5-20 mg/24 hr: 1 patch 24 hrly. Rotate site of application everyday. Max: 20 mg/day. Prophylactic treatment of phlebitis and extravasation secondary to venous cannulation Apply one 5-mg patch distal to the IV site, replace patch at a different site either daily or after 3-4 days depending on the patch. Use for as long as IV infusion is maintained. Facial flushing, dizziness, tachycardia, throbbing headache and tolerance. Large doses can cause vomiting, restlessness, hypotension, syncope, rarely cyanosis and methaemoglobinaemia, impaired respiration, bradycardia. IV admin: IV preparation contains substantial quantities of alcohol and alcohol intoxication can occur. Sublingual Tabs/Spray: Dry mouth, localised burning sensation. Topical: Contact dermatitis, erythema, local irritation. Transdermal patches: Contact dermatitis, metal-containing patches should be removed before cardioversion, defibrillation, diathermy. Buccal tablets: Delayed dissolution, may be swallowed by mistake. Potentially Fatal: Hypotension, paradoxical bradycardia, impaired respiration, syncope and collapse. insulin-dependent) diabetes. It is sometimes used in combination with other diabetes medications, but is not for treating type 1 diabetes. Many people using Januvia do not have serious side effects. Side effects that may occur with Januvia include runny or stuffy nose, sore throat, headache, back pain, joint or muscle pain, nausea, stomach pain, diarrhea, or constipation. Although Januvia by itself usually does not cause low blood sugar (hypoglycemia), low blood sugar may occur if Januvia is prescribed with other anti-diabetic medications.The recommended dose of Januvia is 100 mg once daily. Januvia may interact with digoxin, , non-steroidal anti-inflammatory drugs (NSAIDs), or other salicylates, sulfa drugs, monoamine oxidase inhibitors (MAOIs), or beta-blockers. Tell your doctor all prescription and over-the-counter medications you use. During pregnancy Januvia should be used only when prescribed. Pregnancy may cause or worsen diabetes. Your doctor may change your diabetes treatment during pregnancy. It is unknown if this drug passes into breast milk. Consult your doctor before breast-feeding. Our Januvia (sitagliptin) Side Effects Drug Center provides a comprehensive view of available drug information on the potential side effects when taking this medication. If you get any side effects, talk to your doctor, pharmacist, or nurse. This includes any possible side effects not listed in this leaflet. 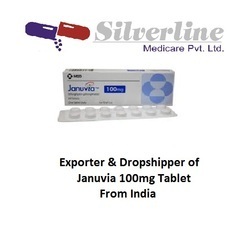 See section 4.Januvia contains the active substance sitagliptin which is a member of a class of medicines called DPP-4 inhibitors (dipeptidyl peptidase-4 inhibitors) that lowers blood sugar levels in adult patients with type 2 diabetes mellitus. if you are allergic to sitagliptin or any of the other ingredients of this medicine (listed in section 6).Cases of inflammation of the pancreas (pancreatitis) have been reported in patients receiving Januvia (see section 4). 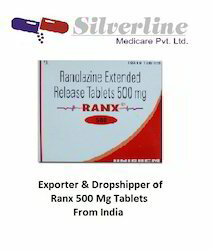 Our organization has successfully expanded its business in market owing to the offered elevated quality array of Ranx 500 mg Tablets. This Ranx tablet is processed by vendor’s experts using best quality ingredients & leading methodology in accordance with the market standards. Offered Ranx tablet is provided in numerous grades in tamper proof packing. As well, this Ranx tablet is tested on numerous stages by quality controllers so as to deliver a pure range from our side. Ranx 500 mg tablet decreases the oxygen requirement of the heart by shifting its metabolism from fats to glucose. As a result, the heart works more efficiently. In order to meet the various requirements of our esteemed clients, we are engaged in offering Trental 400mg Tablet. Our offered trental tablets are used to treat chronic circulation disorders of the arms and legs. These trental tablets are processed in an extremely hygienic condition by using optimal quality ingredients. 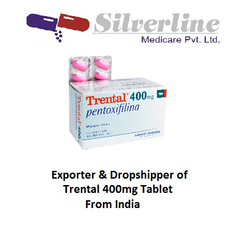 Offered trental tablets are tested by vendor’s experts for ensuring its quality range. Looking for Cardiac and Blood Vascular Products ?